Of course, Ashgabat says it doesn’t need the help but the offer stands. Russian Foreign Minister Sergei Lavrov spent two days in Ashgabat this week opening a new embassy complex and discussing a range of issues with both his counterpart and with Turkmen President Gurbanguly Berdimuhamedov. Among the issues discussed, as reported by TASS, were the Caspian Sea, terrorism and border security, a possible transport corridor, and a Turkmen invitation for Russian President Vladimir Putin to visit. Lavrov also said that Russia is ready to help Turkmenistan protect its border with Afghanistan. Turkmenistan’s 804 kilometer border with Afghanistan has increasingly become a source of regional worry, but Ashgabat has been strident about its control. In October 2015, Turkmenistan reacted badly to an off-hand comment by Kazakhstan’s president about incidents on the Turkmen and Tajik borders with Afghanistan. Later that month, fighting in Afghanistan reached the Turkmen border when a group of Taliban fleeing Afghan security forces sought refuge on an island in the Amu Darya that separates Afghanistan from Turkmenistan. Lavrov said, however, that Turkmenistan has the border situation under control. “If they need help in these efforts, of course, we will be interested. But I will repeat once again. Today our Turkmen friends told us in detail how they protect the border with Afghanistan. We proceed from this,” he said, according to TASS. 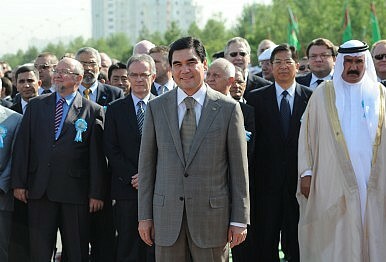 Turkmenistan, which maintains a policy of neutrality, does not participate in regional security alliances. The CSTO, for example, engaged in several exercises last year aimed at preparing for a veritable invasion of terrorists from the south. Turkmenistan, which is not a member, did not participate (neither did Uzbekistan, which has an on-off relationship with the CSTO and has been out since 2012). It’s unclear how prepared the Turkmen are for trouble on the border. The incident last October ended with the Taliban crossing back into Afghanistan and battling Afghan forces there. Captured militants, as noted by Bruce Pannier at RFE/RL, said the Turkmens had fed them and told them to leave. The announcement illustrates how corroded gas relations between Ashgabat and Moscow have gotten.